Ben Robinson|GoBuccs.com Covington’s Spencer Brumbaugh gets off a shot against Northwestern Saturday. COVINGTON —- The Covington Buccaneers have had the misfortune of facing teams who have a player who can take over a game. Friday night in an 83-67 loss to bethel, Kendall James lit the Buccs up for 32 points and tonight it was Jordan Noffke of Northwestern who gave Covington fits by dropping a 34 spot on the Buccaneers. Still, Covington had its chances, but couldn’t seem to get over the hump in a 70-66 defeat to the Warriors in what was a very physical and intense contest. Neither team had much offensive success early as Northwestern held a 5-2 lead midway through the opening frame thanks to a Noffke trey and a bucket by Landon Burns. But a trey by Zach Kuntz seemed to ignite the Buccaneers as Covington outscored Northwestern 11-6 over the remainder of the first quarter for a 13-11 lead. The game turned into a back-and-forth affair in the second quarter, but Covington received a huge break with under 1:00 left in the half as Northwestern was tagged with a flagrant foul. The Buccs connected on the two free throws and capitalized with a bucket by Chad Yohey to take a 25-20 lead. Unfortunately for Covington, it was tagged with a flagrant foul of its own on the ensuing possession and Northwestern took advantage by hitting one of two free throws and a runner off the inbounds play with 16 second left in the half. 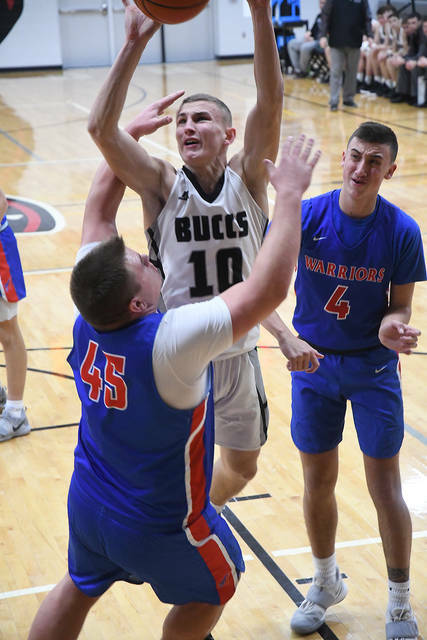 The Buccaneers put the ball in the hands of Kleyton Maschino on the inbounds and the Buccaneer junior drove to the basket – only to see the ball bounce off the rim and into the hands of teammate Zach Kuntz. Kuntz quickly put a shot up from ten feet out and saw nothing but net as he was fouled at the buzzer. Kuntz couldn’t convert the extra point at the free thow line, but Covington went into the break with a 27-23 lead and the momentum. The Buccs came out of the break on fire to start the second half and eventually pushed their advantage to 41-31 midway through the period. Which is when Noffke took over the game for Northwestern on four straight three-pointers on consecutive possessions. In all, Noffke scored 18 points in the third quarter as Northwestern took a 49-47 lead into the final eight minutes. 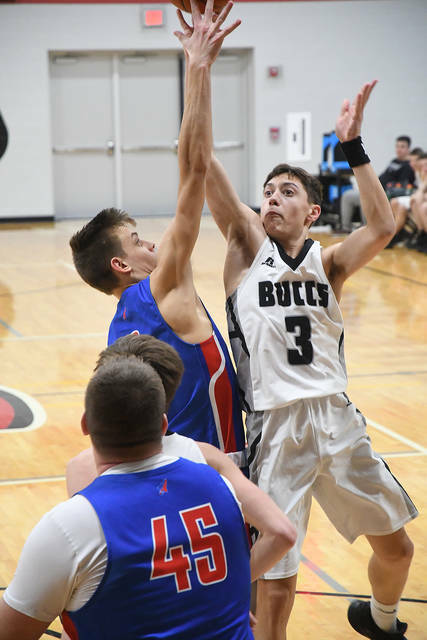 And the final quarter was a barn burner as Northwestern built a seven-point lead at the six minute mark when Covington’s Gray Harshbarger was fouled away from the ball by Northwestern’s Korbin Spencer for a one-and-one opportunity. Immediately, Spencer was tagged with a technical foul – his fifth foul – after questioning the call and Noffke was teed up as well for his fourth foul. Unfortunately Covington misfired on the front end of the one-and-one, but Maschino was able to salvage some momentum by making all four free throws off of the two technical fouls to pull Covington to within striking distance, 60-57. But Noffke is a gamer for Northwestern and even though he was playing with four fouls he was able to knock down two more treys and four free throws to seal Covington’s fate, 70-66. Covington was led in scoring with 20 points by Andrew Cates, 16 points by Maschino and 12 points by Zach Kuntz. Noffke led Northwestern with a game-high 34 points, while Landon Burns contributed with 13 points. The loss drops the Buccaneers to 3-13 on the season as they look to get over the hump on Tuesday at Ansonia. 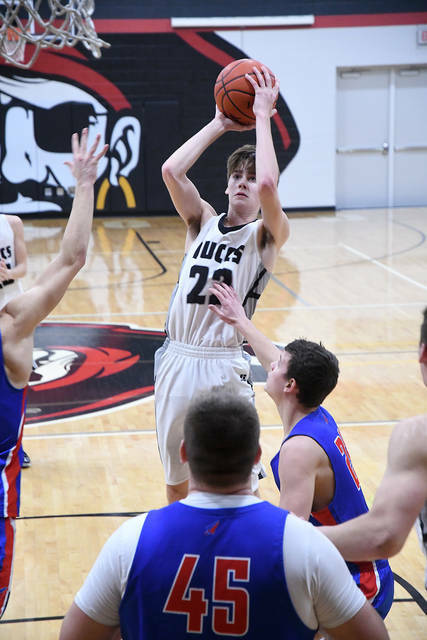 https://www.tdn-net.com/wp-content/uploads/sites/21/2019/02/web1_spencer-brumbaugh.jpgBen Robinson|GoBuccs.com Covington’s Spencer Brumbaugh gets off a shot against Northwestern Saturday.